Stars: Amandla Stenberg, Regina Hall, Russell Hornsby, Lamar Johnson, Issa Rae, Algee Smith, Sabrina Carpenter, Common, K.J. Apa, Rayven Symone Ferrell, Myles Evans, TJ Wright, Megan Lawless, Rhonda Johnson Dents, Al Mitchell, Karan Kendrick, Andrene Ward-Hammond, Drew Starkey, Kurt Yue, Susan Santiago, Brian Lafontaine, Tanya Christiansen, Bianca Haley, Javon Johnson, Tony Vaughn, Marcia Wright, and Anthony Mackie. Sixteen year old African American Starr Carter (played by Amandla Stenberg, from The Hunger Games, etc) is caught between two worlds. She lives with her family in the ironically named Garden Heights, a predominantly impoverished black neighbourhood in Georgia, but she attends Wilmington Prep, a prestigious primarily white school in a more affluent adjoining neighbourhood. At school Starr carefully protects her identity and hides the truth about where she comes from. She also has a boyfriend inthe handsome white Chris (K J Apa, from the tv series Riverdale, etc, who replaced original star Kian Lawley after he was fired for posting racial slurs online). But her situation grows more complicated one night when she attends a party. There she reconnects with a former childhood friend Khalil (played by Algee Smith, from Detroit, etc), who now works as a drug dealer for local crime kingpin King (Anthony Mackie, from The Hurt Locker, etc). A fright breaks out at the party, shots are fired, and Khalil drives Starr away from the scene. They are pulled over by a police car. Khalil gives the white policeman a bit of attitude and is shot and killed by the nervous rookie. Starr faces a dilemma. The police are eager to justify the shooting and want to make the case all about Khalil’s drug dealing past. But if Starr, who is the only witness to what really happened, talks then her friends at school will find out the truth about her origins. And King himself doesn’t want any undue attention on his activities in the heated aftermath of the shooting and threatens Starr to ensure she remains quiet about what she saw. Starr’s father Maverick (Russell Hornsby, from Creed II, etc) used to work for King, but having served time he has now gone straight and runs a local convenience store. He has instilled in Starr and her younger brother a healthy distrust of the police, even though he uncle Carlos (Common, from Hunter Killer, etc) is a police officer. A reformed criminal, Maverick himself is caught between protecting his family and adhering to the old saw that what happens in the hood stays in the hood. And her mother Lisa (Regina Hall, from Girls Trip, etc) is the voice of reason at home and has raised Starr to be a strong, proud black woman. Most films based on YA novels tend to be romances or dystopian sci-fi tales, so it’s a little surprising to find one that is thought provoking and tackles such mature themes as racism, corruption, oppression, injustice, police brutality and black identity. But that’s what we get in The Hate U Give, which is based on the best selling 2017 novel written by Angie Thomas which remained on the New York Times bestseller lists for 50 weeks. The novel takes its title from a quote from rapper Tupac Shakur, who was apparently a huge influence on Thomas when she was growing up. The script has been written by the late Audrey Wells (Under The Tuscan Sun, A Dog’s Purpose, etc), and shows how violence and hatred are self-perpetuating cycles. The Hate U Give doesn’t provide easy answers to some difficult questions or moral ambiguities. The Hate U Give is an emotionally charged tale that carries plenty of contemporary resonance, especially for African American audiences, and it is an important story that deserves to be told with its messages of tolerance, courage and empowerment. The Hate U Give is the type of film about the African American experience that filmmakers like Spike Lee or John Singleton would have made a couple of decades ago. But whereas they would have suffused the material with a palpable sense of anger, edge and rawness, some of this vital edge is missing from the straight forward direction of George Tillman jr (Soul Food, etc). His handling of the material is adequate without being flashy or didactic. The voice over narration becomes a little heavy handed and the film also seems a little cliched and too long for what it has to say. Nonetheless, Till draws some superb performances from his main cast. Especially good is Stenberg in her biggest role to date. Starr is smart, sassy, funny, angry, vulnerable and confused, and Stenberg manages to convey these emotions in her layered and complex attention grabbing performance. 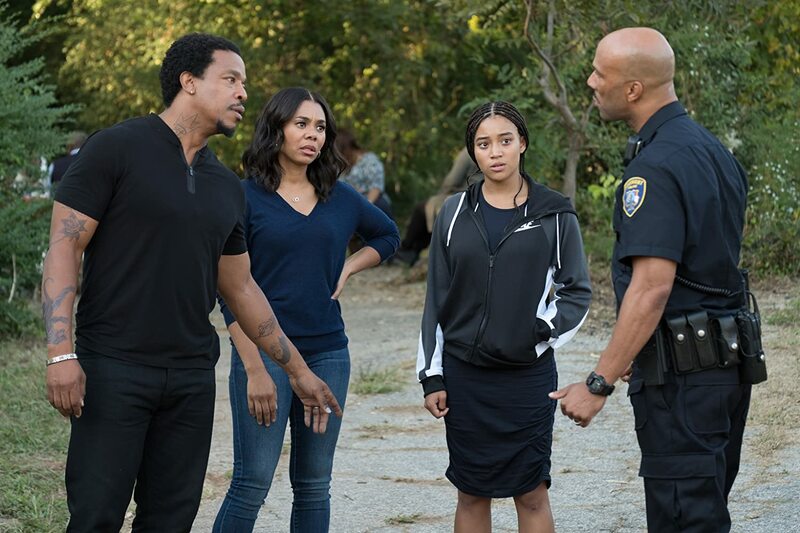 Hornsby gives a layered and at times tender performance as her father, while Mackie oozes menace.The Hate U Give is a teen drama that has more bite and relevance than most other recent YA adaptations.